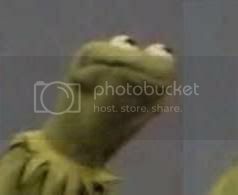 As a welcome-to-the-staff gift, I give all of you permission to use kermit whenever you see fit. It's OK... we have a natural balance in the ecosystem... Reddix brings the leprechauns and Mantis exterminates them. omg, that face is so sad I think it's gonna make me seriously cry irl! I'm sorry Redial! Beatrice wrote: Congratulations to all three of you !!! There appears to be a glitch in the matrix..... Mantis... better check for leprechauns in the moderator controls. It's a bad omen isn't it? I'm gonna get a warning for this!!! Why anyone volunteers for this thankless and no doubt time-consuming labour I know not. Still, on the questionable presumption that I should welcome the curtailment of my free speech ( ), congratulations! Congrats to all, so forth. This, I know, can be a tough ask, and can demand commitment beyond reason. Bon chanche, and try to get some power-naps . anthroban wrote: Orly? I guess my application was summarily binned. Or a 4 ton mantis, eh akigr8. starr wrote: Thank you to everyone who applied in our recent recruitment round for new moderators. It was a strong field. Congratulations, Sityl, Mantisdreamz and Reddix!! or commiserations! "Together we'll pull through. We are the strong, the brave, the few"
Congratulations to the new three.....but also to all thought who applied. We really appreciate your willingness to give up your own time to make this a better place. Congratulations and best wishes to the new staff members (although methinks Virphen may have had a point earlier in this thread ).